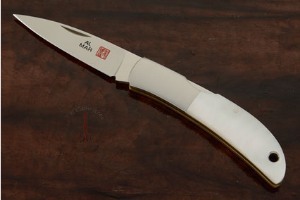 Cutting edge length: 2.25 in. 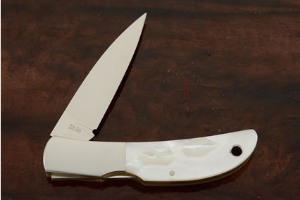 Blade height (at heel): 0.55 in. Description: The Hawk, an Al Mar classic since 1979, is a perfectly sized "gentleman's" knife -- reflecting timeless design and peerless craftsmanship. 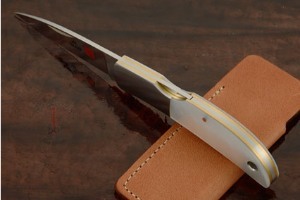 The Hawk is made with the same attention to detail that you expect to see in a handmade custom knife. 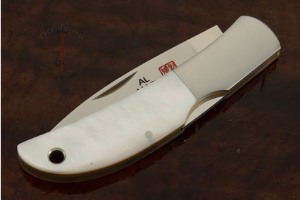 This Al Mar Hawk features whitelip mother of pearl scales. 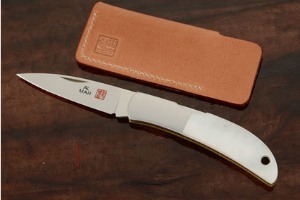 A leather pocket pouch makes it easy to keep the Hawk close at hand.